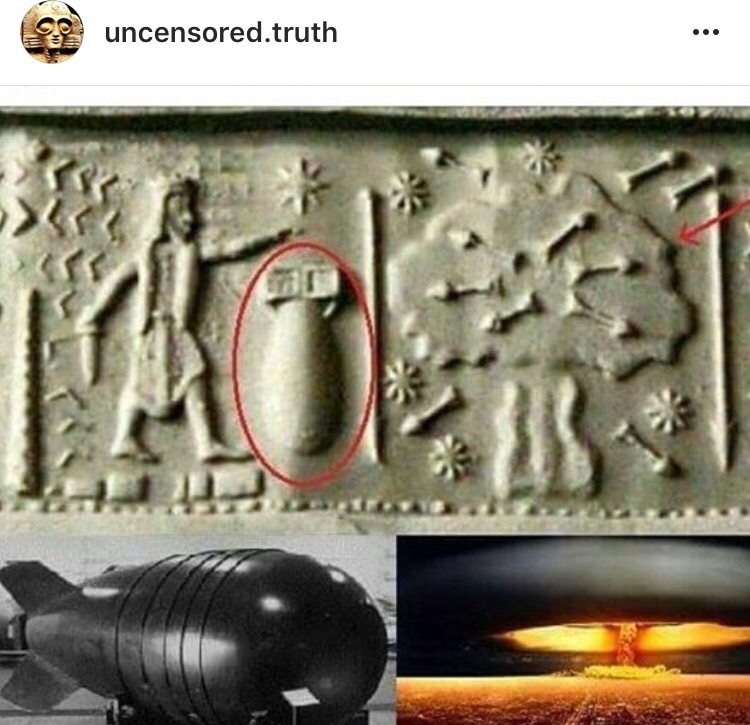 Atomic Bomb Depicted in Ancient Seal? No. Modern Art. You may see this image on places like Pinterest and Instagram, posted without fact checking as proof of ancient super technology. This is art by Steven Parker. It’s a parody. There is also a full story of how the seal was supposedly discovered. The day of my tour arrived, and Dr. Sedyeqh informed me that we would be going to the collection in the late evening for an undisturbed viewing. … Offering to show me her client’s favorite piece, Dr. Sedyeqh removed a small object from a case and handing it to me, explaining that it was from the realm of Nebuchadnezzar II, around 600 B.C.E.. At that moment, we heard the sound of a distant door opening, and I saw a look of panic on Dr. Sedyeqh’s face. I did not understand what was so unhappy about the situation, but perhaps Dr Sedyech had forgotten to make all of the proper notifications for our visit. Cautiously inspecting the hall outside, she quickly brought me back the way we came, out to the car, and back to my quarters. Arriving back in my studios in New York, I immediately began a study of the cylinder seal. The intaglio was carved into a cylinder of gold, capped on one end by polished lapis lazuli (Fig. 1), and on the other by a flat seal carved in gold with the symbol of Ishtar, an eight pointed star (Fig. 2). Here’s an image of the cylinder seal on their web site. It opens to reveal two more inner seals, one of which has the bomb imprint. Quite inventive. Nicely done. It would be an amusing piece to own, to perhaps keep in a glass trophy case to show special friends who think you are a world traveling mystery collector. I do hope you noticed right away that it looks in improbably excellent condition for an artifact that is supposedly 2,600 year old. Nebuchadnezzar II did rein as a king of Babylon around 605-562 BC, so that small detail was true. If you read the “About” page on the acmeclockworks web site, however, you see that it is a parody. Acme Clockworks represents the work of Steven Parker. As you browse through the site, you will also find pieces that result from collaborative efforts with other artists – the synergy of such creation is incredibly rewarding. Over the years, Steven Parker has been active in the design and manufacture of product in two industries – toys and jewelry. The work you see here brings together the knowledge culled from that experience with the elements of mechanics, narrative, and an interactive experience woven throughout. Another element present in some of Mr. Parker’s work may be apparent in the discoveries documented here of Mr. Parker’s alter ego, Dr. Kent Streaver – a barely perceptible hint of parody. We hope you enjoy the work shown here, and look forward to adding more to the mix. How do you uncover the truth about things like this? Search for the image. See my previous post on how to fact check a photo. Here are a few sites posting this image without fact checking it and without telling the truth about it. Ancient-code.com uses the image as a teaser for a speculative article about ancient nukes, but it does not claim the image is real, it also does not explain that it is a work of modern art. Strange truth is harder to find and at times harder to believe than the fakes which are liked by thousands on social media, but the real strange truths are out there if we keep looking.